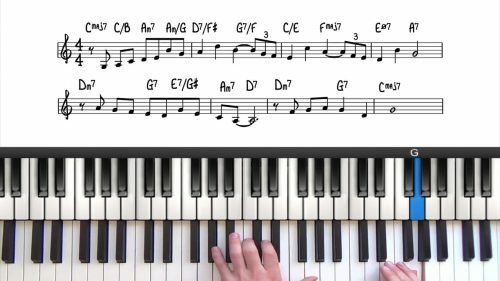 In this "5-minute masterclass", we’re going to talk about the different ways you can create a solo piano intro to a jazz standard. 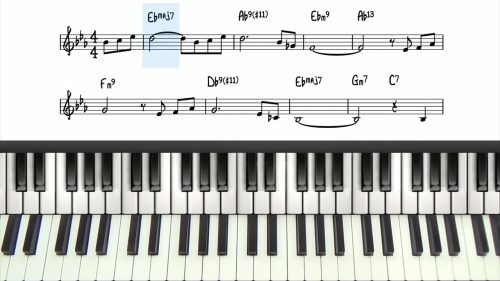 We can always play the last 4 or 8 bars of the tune as an intro, but during this masterclass, we will explore other ways to create introductions for any tune. It’s important to introduce the song in a way that it is clear to everyone when to come in. The first rule to follow is: The simpler the introduction the better. This makes it easier it is for others to come in, and it will create a comfortable mood for everyone who you are playing with. And remember, that "simple" does not mean "uninteresting", it just means that it is clear and logical. We will explore a few ways to derive an introduction from the basic 1625 harmonic progression. This is very commonly used as an intro. The intro can be as long as you want, but it’s good to decide how long it would be, it’s common to choose either 4 or 8 bars. Slash chords contain 2 bits of info, the 1st letter indicates what chord should be played & the 2nd letter specifies the bass note of the chord. The related lesson on "1625 & 436251 Progressions" gives accessible examples for beginner students. This is a good place to start if you are new to the 1625 progression. Many tunes start on the 1 chords, and so the 1625 progression is perfect to lead smoothly into the start of the form. You will come across tunes that start on other scale degrees. Use the examples in this lesson to create beautiful intros into any scale degree. 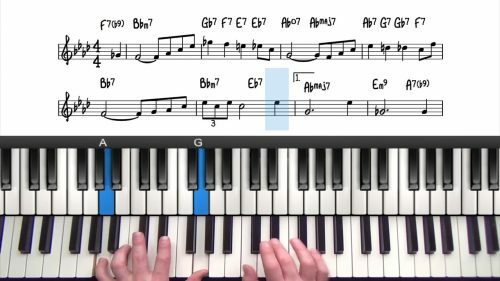 Check out the related lesson on "Block Chords" for information and guidance on this voicing technique. Take these examples around all 12 keys to memorise and internalise these introduction formulas and variations.